I don’t want you to think you can’t rock social networks. I want you to use social media as a powerful tool for your business. Yes, YOU! The key to using social media for business is to develop a strategy first, so that you work smarter, not longer. Posting online all day is not a revenue generating activity unless you’re a Social Media Manager. 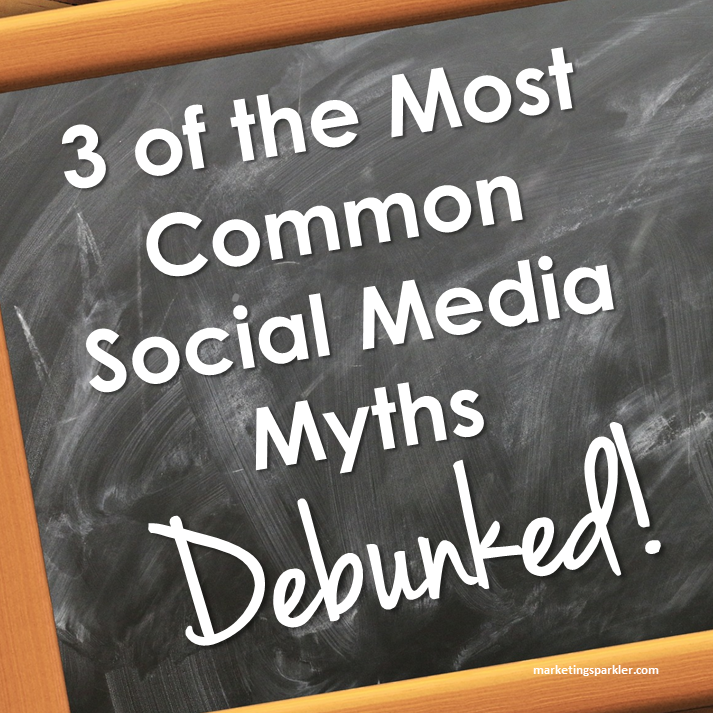 With that being said, let’s get clear on three common misconceptions about social media right now! Myth Number One: Social media is free marketing. Social media is not free marketing. Read my lips: Social media is NOT free marketing. Why? As entrepreneurs, one of our most valuable resources is time. Our time is money. That means, every minute spent on social media is costing you money. Every minute your inexperienced assistant spends on social media is costing you money. So we have to figure out how to efficiently spend our time online. If you are shaking your head thinking this doesn’t apply to you because you have a student intern handling your social media for you, well… you put your brand in the hands of a student, so you have a whole ‘nother problem. Social Media Myth: Social media is free marketing. See why it’s costing you more than you think. Myth Number Two: You can do social media in an hour a day. There is only a snippet of truth to this one, which is why I’m mentioning it. It’s actually one of the most disastrous social media myths floating around. I hear from so many professionals that they’re simply not getting results using social media, and/or they don’t have time to spend on social media because it’s not bringing them any business. They sit at the computer all day long, chatting on Twitter and Facebook, and their phone never rings and their email inbox never sings ka-ching. Then they feel like they just can’t do this social media thing and they kind of fall by the wayside. Or abandon their efforts all together. Does this sound familiar? Have you experienced this feeling? What’s the real story? People see all the gurus talking about how they use social media in one hour a day or less and they get so hyped up. You know what? Those gurus did not start out using social media in one hour a day. They started out using social media for several hours a day, 7 days a week. You’re listening to their pitch AFTER they’ve amassed an incredible following and built a killer brand. If you’re anywhere near starting out on social media, in terms of understanding how it works, gaining real leads or quantity of followers, this one hour advice does not apply to you my friend. Sorry. Myth Number Three: You need to be on every social media platform. You think you need to be on every social media platform, to increase your visibility, build awareness, get your brand seen, and all the other marketing-jargon-filled phrases I hear. Puh-leeze spare me from the marketing hype! Undoubtedly, you’ve heard numerous social media “experts” say, “You need to be on every social network!” Well, that’s terrible advice, and you should simply ignore it. What should you do instead? Figure out which social media platforms your customers are using to find your products and services, pick the best channel, and master it, become a rockstar on that platform. Then, select the second best platform, learn the ins-and-outs of that platform, and become a rockstar there too. Select the third best, rinse and repeat. Social Media Myth: You need to be on every social media platform. Here’s what to do instead. Social media is indeed one of the best things to happen for businesses in a long time. However, simply posting on social media is not a marketing strategy. Social media is a piece of your marketing strategy. It should be aligned with your overall marketing goals. If you don’t have a marketing plan in place, you’ll be wingin’ it on social media, and not really producing the best results. If you don’t have a marketing plan for your biz, social media is not your problem. Marketing strategy is the root of the problem. In which case you need to give me a call or email me TODAY to get one. Seriously. Right now. Don’t wait. So tell me, has this social media myths debunked post helped you understand social media a bit better? Is there another myth you’ve experienced first hand? Leave me a comment and let me know! Agreed Ashley! It is overwhelming and it is time consuming, I readily admit it. The only way to get around this is to experiment with different management methods to find what works best for your schedule and your business goals. So much truth here! I especially loved number 2. I have had to debunk this myth for clients. They get so frustrated with their “one hour” a day method. Yes, hearing everyone talk about success in 1 hour a day is so frustrating! I’ve been there. I come across so many business owners who believe all of these things especially myth #3 they are using platforms that I have never even heard of that their target audience would never be on and then wonder why it isn’t working lol. Great post. You said it Brandi! How can they collect leads if their target audience doesn’t even use the platform? Love this post and glad you cleared up a few myths. Thanks Vanessa. Don’t believe the hype!